P.S – If there is something you would like me to cover, let me know! The Mr. found this and thought it would be something I would like to share. Guess what? He was right! Hope you and enjoy and are informed! It has great information about the power of fruit! Like, comment, share! Most fruits are packed with many vitamins and fiber necessary for a balanced diet. Instead of spending money on vitamin pills, a yummy way of getting your required amount of vitamins is to eat them straight from the food source! Living on a clean, raw diet that includes fruit can have it’s perks that include weight loss, increased energy, and better health overall! Today’s inforgraphic lists the benefits of 20 different fruits for a healthy lifestyle. It is amazing to see the healing properties many of these little fruits contain! However, beware if you are diabetic. While fruit is packed with important vitamins, it is also packed with sugar that can be harmful to a diabetic’s body. Therefore, eat fruits in moderation and seek an alternative method of receiving the daily required amount of vitamins. 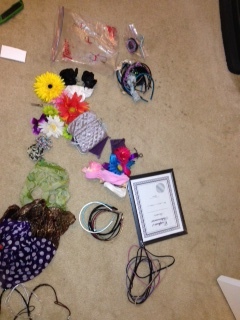 Organizing and crafting part two. For the organization under the sink I made a trip to the handy-dandy Dollar Tree and purchased a picture fame, a storage compartment and some candy to keep me going (vegan of course :). 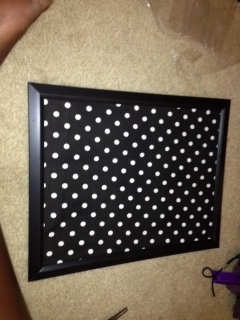 I then went to my craft room and grabbed the glue gun and fabric, I used the last of the black and white polka dot I used on other craft project explained here. I got some picture-hanging hooks from the garage. (Yes, home owners just have that lying around). Then, I got to work. 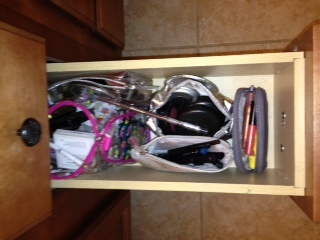 The first step to organizing is taking inventory of what you own and what is staying or going. 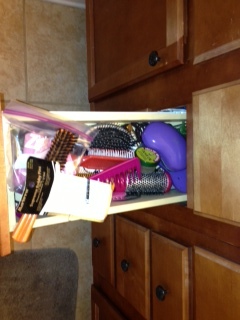 That is what I did with the items under my sink. 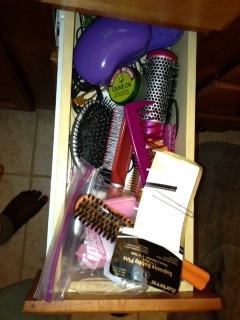 I separated them into hair products, hair tools and beauty products. 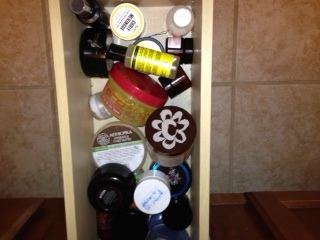 I threw away what I hadn’t used Ina while; what I wasn’t going to use and what was too old to stay. 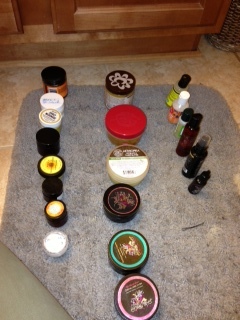 With what was left I organized the hair products by category (leave-ins, deep conditioners, moisturizers, etc.) 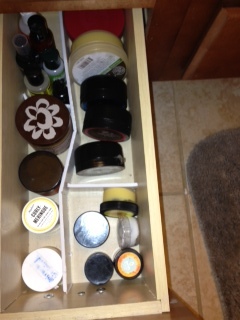 and organized them neatly, making sure they are easily accessible, in a bit I already had. 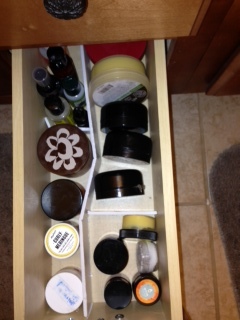 I took the organizer from the dollar store and did the same (organized, discarded, place neatly, ensuring accessibility,) with beauty products. 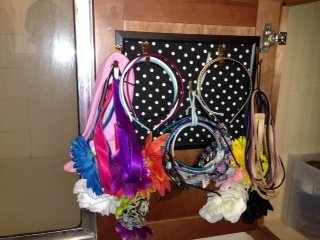 For my hair accessories I used the same process I explained when my earring display. Instead of applying wire I applied the hooks normally used to hang wall art and I used those to hang my headbands (organized by style of course) I then got some one-inch wired ribbon and cut two strips about three inches long. 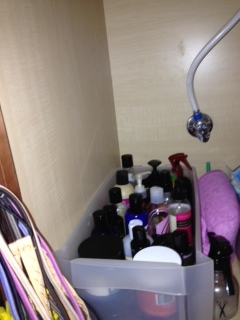 You can use more or less depending on the space you have available. I then added my hair bows to the ribbon. (Remember, accesiblility is key. ) I then mounted a walk hook to the inside of a cabinet door and hung the picture frame. 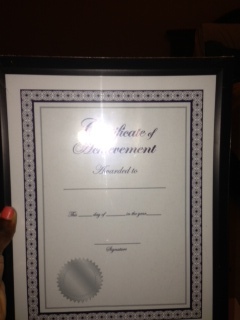 I am thoroughly satisfied!!! This is by far one of the best things I have done. 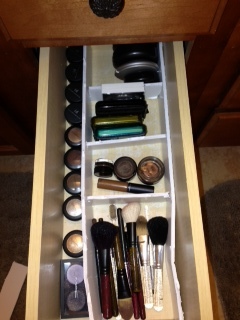 Now, on to the drawers, I attempted to follow this YouTube tutorial but this was WAY more complex than I required. 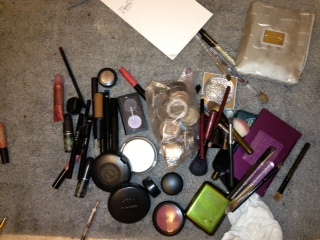 I am not a make up artist and definitely do not have the space capacity the demonstrator did in the video. 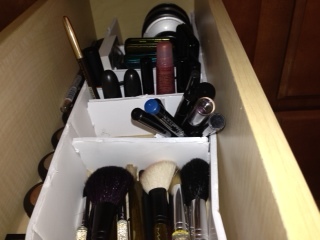 So I separated each drawer on the floor by products type (eye shadow, foundations, brushes, etc. 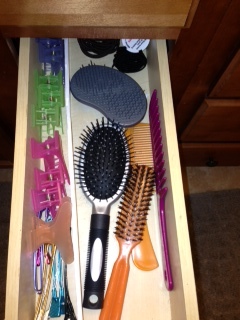 I did this for each drawer- I also have a drawer where I keep my combs, brushes, clips, hair pins and hair ties as well a drawer of hair products (yea, I am a bit of a product junkie). 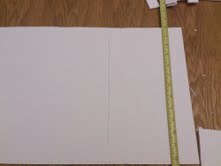 I then used just half 1 extra -large foam board from Hobby Lobby and measured the length and width of the compartments I would need for maximum accessibility. The Mr. Was a great help during this process 🙂 make sure your measurements are very accurate. I thought mines were, but we has to go back to the board and cuts few more times. After you have the boards cut for your specific compartments, assemble by simply placing the boards how you see fit (according to the pieces you cut. I did not use any glue or anything like that. The tension between the boards is sufficient. Plus, this gives you the opportunity to move some things around of your collection grows. I am in love with this as well. I have no idea why I did not so this sooner! I just shared this on my best friends blog southernladylife.wordpress.com and wanted to share with you! Below I have a list of (what I think) are 10 things every southern Mrs. needs in her life. Hope you enjoy. A Full-Proof Cookie Recipe: Cookies soothe the soul. They have the power to comfort a broken heart, dry a child’s tears and bring smiles to so many faces. Every southern Mrs. needs at least one recipe that can do all of the above. Chocolate chip, ginger bread, oatmeal-no matter the kind or variety-as long as the soft, chewy goodness warms the mouths and hearts of those who consume them, you’re good. My full proof recipe can be found here http://www.foodnetwork.com/recipes/ina-garten/raisin-pecan-oatmeal-cookies-recipe/index.html. It may sound fancy but my Mr. loves them and they are super simple to mix and make. A tip: make the dough ahead of time, separate into Ziplock bags and freeze so you always have some on hand for emergencies. By no means do you need to spend your life savings for this great heel. Retailers like Ross, Marshalls and TJ Maxx have awesome brand names that will last a while for good prices. (testimony: I purchased a pair of Nine West 3.5 inch black, patent-leather, round toe pumps more than 3 years ago for $17.99. I have worn them at least 72 times and they still look great. I haven’t even had the heel repaired.) For those of you that have a DSW nearby, pop-in regularly. They have great prices and their sale prices are even better. By better I mean a pair of satin peep-toe heels for a whopping $11. Yes, it is possible to look simply fabulous in designers you can’t even pronounce without breaking your bank. Just try it. Your closet will thank you. Solid Cookware and Food Storage: Any southern Mrs. has had a good Sunday dinner and, has either prepared a few herself or plans to. 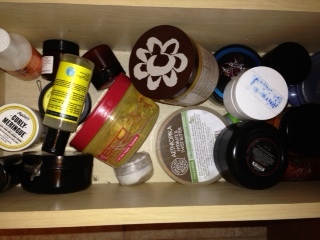 Well, you can’t do that with the crap pots from your first year of undergrad. Maybe you lucked up and got an awesome set as a wedding gift. Maybe you are still on a hunt. (for those hunting check TJ Maxx and Marshalls as well as larger department stores like Macy’s and JC Penny’s. They often have great sale prices on sets and individual pieces.) Now, after you cook this big great meal, you need something to store the leftovers in. Long gone are the days of Tupperware parties (although you can purchase Tupperware online) so grab some Pyrex (Target and JC Penny’s have the best deals) because not only can you store food the fridge, you can also safely reheat the food in the oven or microwave. Because they are glass, they also do not stain! For The Mr. and/or the kiddies lunches, I would suggest an inexpensive BPA free plastic set. You can find these anywhere really but Sam’s has a great price. The benefit to this is that you a wide variety of sizes that assist with portion control. 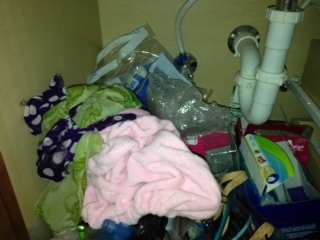 For freezing, foil, saran wrap and Ziplock Freezer bags will do the trick. Make sure to date and label! At Least four things with a monogram: There is nothing cuter than a monogram and every southern Mrs. Needs at least four because you can monogram anything! Hats, purses, cups, key chains, and totes! Whew! 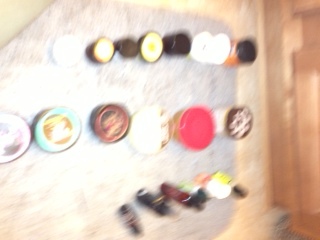 Some of you may be wondering the benefit of having something with your initials plastered on it cute fonts and colors. It simply makes it yours, and that is justification enough. Mani-set, nail polish and polish remover: I know some of you have your nail appointment set every week or two weeks like clock work and could never fathom doing your own nails. Well, what if it is 8 p.m. on a Sunday and you are on your way out of town or headed to a function of sorts and your nail breaks, the polish chips and your favorite nail salon is very closed. Are you really going to travel to somewhere or get all gussied up with jacked up nails?!?!? Absolutely not. For the most part, you will need just a nail file and remover and polish, but it doesn’t hurt to have tweezers for hang-nails and good top coat, even if it is just to hold you can get back to your manicurist. Gym Membership or At-home fitness routine: Again, if you weigh below 92lbs, have been mistaken for a super model or a nine year-old child, please disregard and go to the next. For the rest of us, those Sunday dinners catch up with you. Even if you are relatively fit and small in stature, with age comes a slower metabolism. You want to get in the habit of making it a priority to take initiative and exercise. If you can’t have a gym membership at this time, utilize your cable box, DVDs and the internet. There are great fitness tips and classes to guide you. You can get weights or medicine balls ANYWHERE, I have seen them at the dollar store. Not to mention, us southerners are not known for healthy living. I am sure everyone who reads this knows at least one person in their family with hypertension, diabetes, or high cholesterol. Take your health seriously! If you do have health concerns, please consult your physician to get a list of do’s and don’ts before getting fit. A great southern gal pal: Yes, you can shopping by yourself or mull over whatever it was that irritated the stew out of you earlier all on your lonesome, but it is better to share. Not because of that old saying, ‘misery loves company’ but because a great gal pal loves you, not your misery; and because she loves you and wants the best for you she will work through that misery with you. She will also tell you that you can’t pull off a size 2 anymore but that is because you have a booty people pay for. She will listen to you wish your Mr. to Hades and agree with everything you say unless it is utter nonsense and then she will bring back to reality. A southern BFF is like needed just like pockets on jeans, you may not use them every day, but you sure are thankful they are there when you do! A Bible: The south is also known as the bible belt, and for good reason. Every place I have been in the south, there is a church on every corner, sometimes two. You may carry your bible to church with you every day of the week and twice on Sundays, or leave in the back of your car. You may just keep it in the house and dust it off before your mother (or mother-in-law) comes to visit. At the end of the day, sometimes you may need a good word or a point of reference. In this day and age, you can just use your handy-dandy bible app or do a Google search, but just in case, keep one handy. A sense of pride: For who you are, what you are, what you will be, what you have, and (most importantly) where you come from. There is nothing stronger than southern roots. 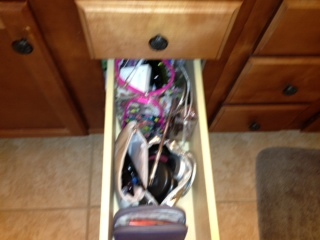 Please share my hits and misses with me at hitswiththemrs.com. 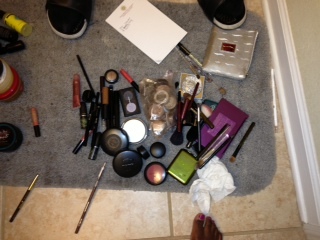 I also have some great resources and tutorials to help all the Mrs.’ out there!